Rum, pineapple and yellow tomato juice? It's true, it works. Taste for yourself in this tropical take on the classic brunch Bloody Mary. Break out the juicer for this light, bright version of the classic Bloody. Thanks to a tropical mix of pineapple and coconut water, this is a bit sweeter than the typical Bloody Mary, but it’s not cloying. A generous dose of black pepper adds a mouthwatering edge. In cocktail shaker, combine all ingredients (except garnishes) with ice. Shake well, and strain into rocks glass with fresh ice. Garnish. Serves 1. Combine all ingredients in large pitcher. Refrigerate in sealed container for up to 2 days. Makes 3 cups, enough for 10 drinks. • In America, brunch was called the “varsity meal” for its association with (usually hungover) college students. • The boozy brunch kicked off during the Prohibition years. The upper crust, who had access to plenty of illicit alcohol, would typically enjoy a leisurely, decadent meal the morning after a night of drinking. 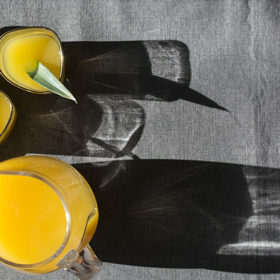 In a private home or club, there was no restriction against pouring bubbly (or bootleg vodka) into your orange juice, Mimosa-style, to ease that pesky hangover. • Brunch began to catch on in the United States in the 1930s. Cookbooks and newspapers started to give the concept momentum. Not everyone was a fan, though. “At all events, let me implore you not to call your breakfast, at no matter what hour, a brunch,” wrote etiquette expert Emily Post in a 1936 column. • Chicago was famed for popularizing brunch, as movie stars would stop over in the Windy City for a break during cross-country railway treks. Noted Sunday brunchers at The Pump Room at the former Ambassador Hotel included silver-screen favorites John Barrymore, Helen Hayes and Clark Gable. • After World War II, hotels became champions of the fancy brunch. Most restaurants were closed on Sundays and church attendance was on the decline. Restaurants hopped on the bandwagon much later.